John Pavlovitz is an “18-year ministry veteran trying to figure out how to love people well and to live-out the red letters of Jesus.” He proudly serves the North Raleigh Community Church as pastor of people in the Raleigh area and throughout the world. John writes a blog called John Pavlovitz – Stuff That Needs To Be Said (http://johnpavlovitz.com). 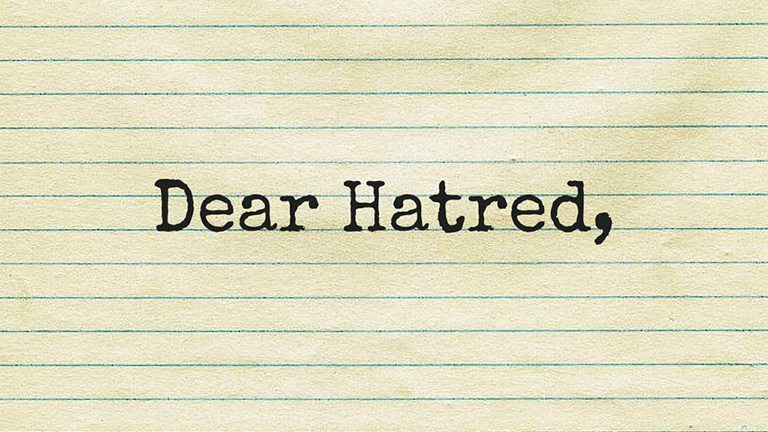 Recently John wrote one of his “musings” called “Dear Hatred, From Love”; posted JULY 19, 2016. Actually, from the looks of things out there business is booming for you lately. I’ve got to hand it to you, you’ve managed to keep yourself in the news pretty steadily and these days that’s no small feat. Your ability to reinvent yourself is a credit to your persistence and to you knowing your audience. I’ll confess, your brand is a whole lot stronger than I’d realized. Somehow you’ve been able to leverage all that fear out there into a pretty impressive little cottage industry. I see you’ve even secured a Presidential candidate. To be honest, I’ve been in a pretty deep funk with all that’s happening, myself. For a while I’ve been struggling to find any real momentum; one step forward, eighteen steps back. I’d started to think maybe I was obsolete, like I’d finally become passé; destined to be a dusty relic of the past and relegated to faded t-shirts and power ballads. I was seriously considering calling it a day. But this morning I realized something: I’m. Freaking. Love. Dammit. I am the glorious, beautiful response to all the havoc you wreak out there. I am the relentless dawn that chases away your heavy darkness. I resurrect all the hope that you seek to destroy. I am the defiant middle finger raised in the face of death, evil, and your pervasive lie that Humanity is beyond saving. I am the redemptive song that people keep finding a way to sing together no matter how difficult the days become. Sure, maybe I’ve had a rough stretch lately, but I’ve been through this all a million times before and I’ve always been able to answer you. And trust me, I will answer now too. Let’s face it, deep down we both know how this is going to play out, don’t we? You’ll grab the headlines and make a dramatic statement and chaos will briefly come, and you’ll feel and seem like you’re winning. You’ll get a bit of traction and you’ll celebrate for a moment. But it won’t be long until I rise up and slowly drive back beneath the ground all the terrible Hell that you managed to raise. Like yeast in the dough I will quietly and silently do the healing work I do; person by person, heart by heart, breath by breath. And then I will be the one dancing. You’ve probably noticed that I don’t resort to all the bombast and theatrics you’re known for. That may move the needle and make the news, but it doesn’t last and anyway it’s never really been my style. I prefer to just keep going—and waiting. Because the truth is, goodness is Humanity’s default setting, and when people stop to breathe, when they step away from the screaming fray, when they draw nearer to one another they recognize that goodness in the other’s eyes—and then you’re screwed. People will always return to compassion and mercy because those are the most powerful forces on the planet. And when they do, they find me there waiting. They embrace me and I them. Yes, you may occasionally corrupt the system, but I am the system. I am the truth that people know without knowing they know it. I am the deepest sacred place the human heart will always seek at its level. When hurting, grieving, weary souls search for rest, I am where and when they finally find themselves home. So you can have your eye for any eye, and I will keep making peace. You can demand revenge and I will keep forgiving. You can spew venom and I’ll turn my cheek. You can posture and incite with a closed fist, and I will stretch out my open hand. You can gloat and brag and feel quite pleased with yourself for the momentary terror you’ve manufactured—and I will press firmly into that which endures and defeats it. Yes, you are powerful and resilient, friend, but you’ll never overcome me and you won’t outlast me. No matter what unspeakable damage you do, I will bring even greater healing. And no matter how much you say I will always have the last, loudest word—trust me on this. Look around you. Look beneath the headlines and the noise. Look deeply into the eyes of those who get me and see how much they’re willing to do. My people will not be denied. You can’t win this one, friend, no matter what you or the papers say. It’s been a long time since we have met. How are you? I was busy so I couldn’t write you. Now instead of being monotonous I will straight away write you what I feel. Ok, ok I guess you are annoyed with me. I know the situation right now. This day is what you call in Hindi a “kali yug” (a day of strife, contention). People hate me, but at the same time my name is stable because of this feeling of hate. Yet not all this hate is aimed at me. Some like terrorists, kidnappers or those whose hearts are filled with me and wanting to take revenge on those who hate me. Indeed, they are the only ones who are filled with me. They want that people should develop a sense of hostility, suspicion and contempt. Isn’t that delightful? Because of what’s in their hearts, now the people are filled with rage, hostility, hatred and revenge. Me! Filled with me! But don’t be sad, there are also those people in this world who still have endless love and compassion. I know that all the great leaders throughout history have taught mankind that this love is a wonderful thing. You are a powerful weapon which can sweep away all the envy, jealousy and scorn. I am happy for you. Now, because of the terrorist attacks and killing of police officers that are filling many hearts with despair, feelings of hopelessness, desperation and fear, I am seeing the headlines and feeling the drama and chaos playing out in the streets. But you know what, something really perplexes me. We both can’t exist together. Where there is love, there’s no place for hatred and where there is hatred, there’s no place for love. But we both are important. Ok friend, I know I am creating a situation which is a paradox for you. But just think about it. If God has made sorrow, He has also made happiness; if He has made night, He has also made day; if He has made problems, He has also made solutions; similarly, if He has made you, He has also made me. Love has been preached from the heights of Mt. Zion to the valley below. I know I am not good but I am not all that bad either. Yes, only you can heal the world from this sickness. But if there is hatred in the hearts of mankind, there is no love. God does what is good for His people. If He disciplines mankind because of something he has done wrong, it is to teach him the message of faith, hope and love and to rely on Him. So please look at the other side of the coin. This entry was posted in Christianity and tagged Breath, Chaos, Death, Defeat, Drama, Evil, Forgiving, Grieving, Hate, Havoc, Headlines, Healing, Heart, Heavy Darkness, Hell, Hope, Hurting, Lies, Love, Peace, Quitting, Redemption, Rest, Song, Souls, Weary, Winning on 07/25/2016 by gsoulen51.